Kawhi Leonard, Dewayne Dedmon lead Spurs to comfortable win. 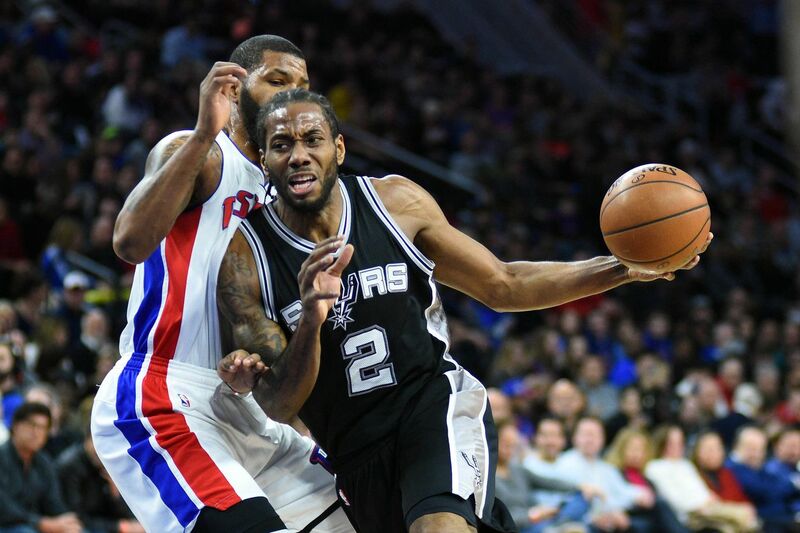 The Spurs played their final game at the Palace at Auburn Hills and didn’t disappoint thanks to another 30-point game from Kawhi Leonard and double-double from Dewayne Dedmon. The team hasn’t been happy with their play lately, and it showed as they played a game that wasn’t perfect but was much closer to what you’d expect against a fringe playoff team. The Spurs started the game with much more aggression than of late, but not many shots would fall for either team. The score was only 8-4 in favor of the Spurs when Pop called his first timeout with 5:55 left in the first quarter. As it always does, the bench came in and sparked the offense, starting with a 3-point play by David Lee. By the end of the quarter the Spurs led 27-19 on 48% shooting. Dedmon was already near his double-double with 10 points and 8 rebounds. The Spurs continued the shoot well to start the second quarter, but play was stopped three minutes in after former Spur Aron Baynes went down with a twisted ankle. Ish Smith continued to be his Spurs-killing self to keep Detroit in it, and he ano turnovers were the only things keeping the Spurs from expanding their lead. They still led 36-30 with 6:01 left in the half despite 7 TO’s. Danny Green hit 3 threes, and the Spurs ended the half on a 19-6 run to take a 60-41 lead on 57% shooting. It was more of the same to start the third quarter with the Spurs continuing to shoot and defend well. A Dedmon alley-oop from Leonard in transition with just over seven minutes left led to a Stan Van Gundy timeout wth the Spurs up 68-50. The quarter was much slower with the refs using their whistles a lot more, but the Spurs still led 83-66 heading into the final frame after leading by as many as 21. The Pistons started the fourth quarter with a little more effort and got as close as 13, but LaMarcus Aldridge responded with three straight buckets to keep the Pistons at arm’s length. A 15-6 run, capped by an Andre Drummond dunk in transition, got the Pistons within 10 with 5:25 left and led to a timeout from Pop. Leonard stopped the bleeding with a three, and the Spurs maintained a double-digit lead for the rest of the game and went on to win 103-92. Unfortunately it never got to a point where SVG was ready to send in his third unit, which means the Spurs will have to wait until next season to see Boban Marjanovic again. Check back later for more on this one. The Spurs are back in action on Sunday for a 2:30pm tipoff at the never-lacking-for-drama Madison Square Garden.